BRAUN tank suction heaters efficiently heat exiting tank fluids to suitable pumping temperatures and are ideal for viscous fluids such as fuel oils, heavy crudes, and asphalt. 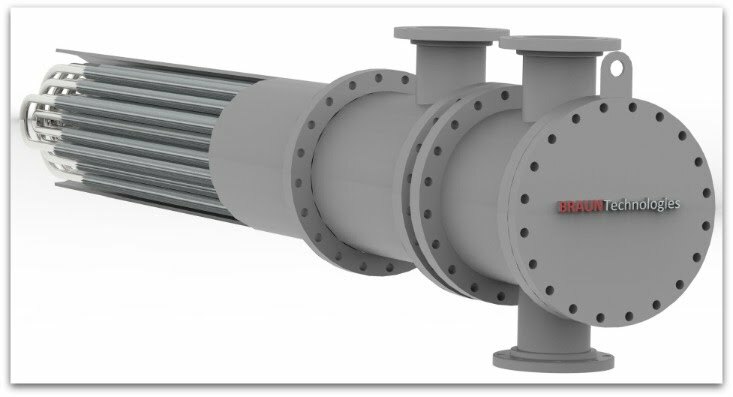 For increased efficiency and to reduce fouling due to high tube wall temperatures, tubes incorporate continuously welded longitudinal fins. All heaters are design to high quality ASME and TEMA standards. Materials are typically carbon steel; however, stainless steel and high alloys are available. Member HTRI - Heat Transfer Research, Inc. Copyright 2011 Braun Technologies Corporation All rights reserved.